Archaeologists state that the oldest piece of pottery ever excavated in the Western Hemisphere was found in Puerto Hormigas, Columbia. Carbon dating tells us that it was made sometime around the year 3000 B.C. This ancient pottery was always made of clay and it was heated so it would not absorb water. Heated pottery is called ceramics. Native Americans used three types of ceramic techniques, molding, modeling, and coiling. Sometimes a combination of the three was used. The first ceramics came in a variety of sizes and were largely used for storage and cooking. Items that were frequently made include; bowls, plates, beakers, jars, and incense burners. The Maya, Inca, and Aztec cultures made funerary items and musical instruments from fired clay. Whistles, horns, drums, and clay flutes have been excavated throughout Mesoamerica. The Chavin culture flourished, around 1500 B.C., in what we now call Peru. 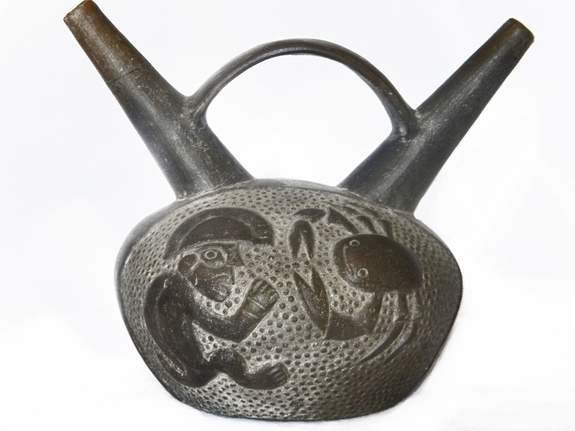 During this time period the Chavin made great ceramic advancements. The Chavin selected only certain types of clay, and they learned how to control the temperature and environment. They did this by using updraft kilns. The Moche, who also flourished in ancient Peru (200 B.C. to 800 A.D.) are largely responsible for turning ceramics into an art form. The Moche used a large variety of designs when making their jars. They made jars that resembled musical instruments, life like figurines, and agricultural products such as fruit. The Inca continued the Moche tradition by adopting many of its styles. However, the Inca did not attain the same artistic level as the Moche. The Teotihuacan culture (150 B.C. to 650 A.D.)that flourished near what we now call Mexico City painted amazing designs on their pottery. However, they are best know for their dolls. These dolls came with movable parts and could swivel 360 degrees. Sometime around 900 A.D., the Maya began working with pottery dyes or color pigments. Painted pottery had to be fired at a lower temperature. The Maya also used stamps and learned how to make pottery in orange and black by learning how to control the kiln. They also learned how to make gallon sized jars with twist on lids. The Aztecs made thousands of items from clay pottery. When Cortes and his men visited the great Aztec marketplace of Tlateloco the found beautiful pots, in all shapes and sizes for sale.